Lately it seems like walnut trees have been getting all the attention. And it's well deserved - their high timber value and beautiful wood make them a prized species for growers and consumers. We have a good amount of walnut that grows on the farm and one day, we'll do a post about them. But today I want to give some praise to a different species. Oak. Not "The Big Oak" (see below!) but a big white oak on Arington Tree Farm. Oak is a valuable species in many ways. They're native to Wisconsin, meaning they began growing here naturally, without any human intervention. They are a durable, strong species and have withstood the test of time - surviving the prairie fires started by Native Americans and intense grazing by dairy herds. Oak trees have incredible wildlife value. Many varieties of wildlife feast on their acorns and live amonst their large canopies. 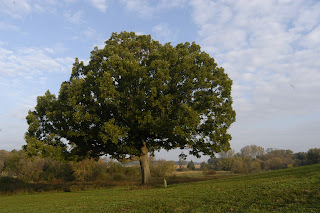 Additionally, oaks can grow to massive sizes - few other species will grow as large as an oak tree. All that growth takes time - oaks don't grow quite as fast as walnut, and while they currently don't bring in the top dollar at the sawmill that walnut does, their wood is still some of the most beautiful and is often used to make furniture and family heirlooms. Did you know there are 600 different oak species in the world, and almost 80 of them grow in North America? We don't have quite that variety growing on the farm, but do have red, black, bur, white and swamp white oaks at various stages of their life cycles - from the white oaks that were just planted by students last spring for Arbor Day, to the huge white oak that sits in the back corner of Joe's yard. It is that tree ("The Big Oak") that we'll be honoring this weekend, as we celebrate it's 200-ish years. In recent years, the tree has begun to split and despite efforts to keep it intact, is becoming a safety hazard. We'll be gathering this Saturday, with family, friends and neighbors, to give the Big Oak a proper send-off: a group reading of Aldo Leopold's "Good Oak," taking turns at the axe, counting the rings of this massive tree, and eventually, planting a new oak in its place. And as with any good party, there will be lots of good food, warm drinks and a fire pit for smores roasting! The Big Oak will find new life as firewood, commemorative coasters and a few other projects Arik and Joe have up their sleeves... stay tuned!